My end goal here - right before Christmas - has been to finish reading Keeping Holiday with the kids and finish reading A Tale of Two Cities by myself. The kids and I made it through our read aloud (leaving me with Dickens, but we're getting on fine). 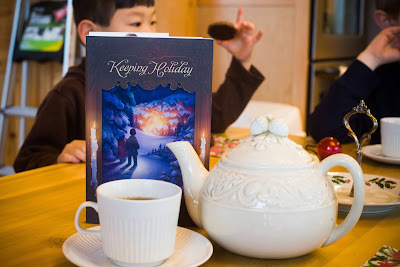 Keeping Holiday , by Starr Meade was a Christmas gift from a dear friend a few years back. I meant to read it with the kids last year but I'm glad that that didn't work out. Everyone was ready for it this year and I'm not so sure that they would have been able to enjoy it quite as much last year. This title made for a very fun and meaningful book to read this holiday season. Part of the reason the reading of this title was so fun was thanks in part to my mother-in-law, who had shared me with her habit of having tea with her kids while she read aloud to them during their growing up years. Every morning (or whenever we could) during the month of December my kids and I have had tea together. While the children enjoyed their snack and drink (sometimes "hot chocolate tea") I would read a chapter of our book. As you might imagine, our reading time was looked forward to each day! Keeping Holiday is a Christmas-themed allegory not completely unlike Pilgrim's Progress (but much easier for young children to understand). It tells the story of Dylan and his cousin Clare. Each year the cousins would visit the town of Holiday with their family and enjoyed their time there very much. There are always parties to attend, beautiful music to listen to and sing along with, and bakery goodies in abundance. Dylan and Clare are well satisfied with such vacations until Dylan discovers that this town of Holiday which he has been visiting is only the visitor's center to the real town of Holiday. Dylan begins a quest to "keep holiday all year round" by finding his way to the real city where holiday never has to end. Before he may do so, he has to meet the founder of Holiday and there is a "bad guy" (to my children's utter delight) trying to distract him and keep him from gaining admittance. Along Dylan and Clare's journey, they run into any variety of Christmas characters (stars, holly trees, Christmas bells) who each share a little bit more about the Founder. ("You don't find the Founder; He finds you. He's not just the Founder; He's the finder too" is a constant refrain.) Dylan struggles with doubts and fears on his quest and he is comforted by having each and everyone of his needs met along the way. One can draw all sorts of analogies. Truthfully, I thought the analogy was not very subtle and bordered on being remarkably un-clever. However, I asked my kids if they knew who Mr. Smith ("the bad guy") or the Founder were supposed to be representing and neither of my boys figured it out. So perhaps it's more subtle to the younger reader. Both boys (aged 7 and 4) thought the book was "very fun" and adventurous. On more than one occasion I was asked to read beyond the daily chapter. They also found any variety of the characters in this book to be greatly amusing and laughed out loud a number of times. Overall, I have to say that although I didn't expect to like the story very much, I found that I rather loved it. It was enjoyable, it was Christmas-y (to suit the season), and the analogy was spot on. I never felt jolted out of the tale by a bad representation of the Gospel message but was able to stay focused and even managed to cry by the end of the story. As one who has been found, I appreciated this read and would recommend it to other families who are looking for a good, solid holiday story to enjoy together during the Christmas season. I'm very grateful for the book which is this gift and happy to have spent our time with it. 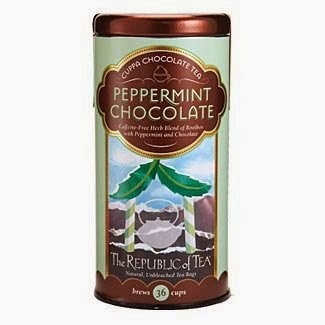 Republic of Tea: PEPPERMINT CHOCOLATE . That's in all caps to emphasize enthusiasm. YUM! Awe. Sounds very sweet. I have to look up the author. I know the name. Aha! We recommend Mighty Acts of God! What a neat tradition! Sounds like a good resource. I just found your blog today (and became a follower) looking for other information on The Pilgrim's Progress. I too drink tea, just bought a new kettle, tea pot, tea (ordered from England).